A grandmother, Ann Pohl is a founding member of Upriver Environment Watch. Last October, she was named in a SLAPP suit by the fracking corporation, SWN Resources Canada. She is currently working with local Mi’kmaq elders to bring a legal challenge to court, to protect the natural environment for the sake of all future generations. Fundraising is just getting underway for the IMW Peace & Friendship Legal Fund. IMW stands for “Iapjiw Maliaptasiktɨtiew Wskwitqamu.” These Mi’kmaq words can be understood to mean Protecting the Earth for Future Generations. 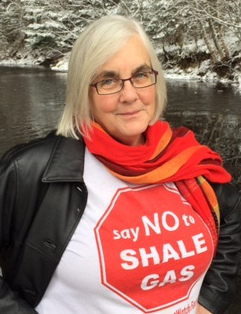 Ann speaks to us today about working with First Nations groups, victory in NB to ban shale drilling and other stories of a grandmother on the front lines. You can learn more about IMW Legal Defence fund, and Ann here. In the second half, Stefan, Kevin and Daryn discuss the news that Ontario Environment Minister Glen Murray announced that Ontario will be pursuing some form of carbon plan. The hosts discuss the benefits of various ways to put a price on carbon, and some of our concerns, despite this good sounding news.